I've seen several lists of Android apps that are must-haves. Throughout the course of the past year, I've tried every single "must-have" app I could find, hoping for gold and mostly finding tin. It made me wonder, what is wrong with the people that are making these lists? How boring must their lives be to suggest such mundanity? I'd like to start with a disclaimer: I like Google. Some would say I'm a fan-boy. I've been early adopter to almost all things Google. I even signed up for Buzz at the earliest possible convenience. This could be one explanation to all the Google apps in the list. Or it could just be that they make good stuff. 1) Google Drive - I've tried several online document backups including SugarSync and DropBox. What makes Google Drive better is the ability to create documents from within the app. Create a document on your phone or tablet, edit it on your PC, send it to a friend to edit on their Mac, and finish it up back on your phone. 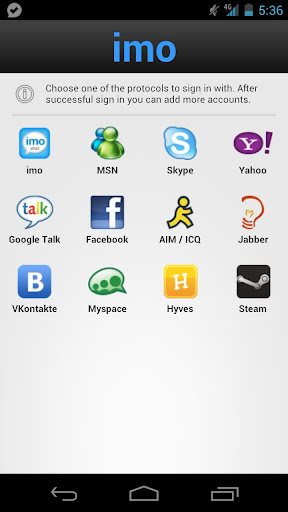 2) IMO.im - There are many all-in-one instant messaging apps. What makes IMO great is that not only can it take the place of Google Talk, AIM, Y! Messenger, MSN Messenger and even Jabber. It also handles Facebook IM and Skype. And it does voice calls. 3) IMDb - If you're anything like me, whenever you watch a movie, you invariably say "what else was (s)he in?" Sure, you could check it out on your mobile browser, but the app is so slick and quick, it's worth the download. Watch trailers, add movies to your watch list or rate movies right from the app. 4) Google Play Music - It's your entire music library ... on your phone ... with the searching power of Google ... and without taking up any space. It beats Pandora in that it's customizable, but the drawback is that if you don't already own it, you're not going to hear it. 5) Google Googles - The multifunctionality of Google Goggles is what really makes it stand out. Not only does it search images (and well, I might add). It also works as a QR scanner, OCR scanner and can scan UPC codes. 6) Pixlr-o-matic - How is this app free? Made by Autodesk, Pixlr-o-matic has more frames, filters and lighting effects than any other image editing software I've seen. It saves back to your card or shares to GMail, Blogger, Instagram, Facebook, whatever. 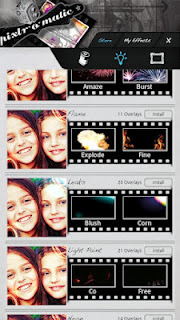 7) JustPictures - Have all of your photos (Flickr, Picasa, Facebook, Smugmug, Photobucket, etc.) in one spot. Plus it will take photos from your phone and batch upload them to that same service. An easy way to backup all your photos at the end of the day. 8) TouchPal Keyboard - A great replacement keyboard to the standard Android keyboard. Don't tap your words, slide your finger from letter to letter and your word just appears. It's similar to but even better than Swype in that it's more customizable. 9) Orbital - Sometimes you just need to kill a few minutes between meetings or blow off some steam before finishing up that big assignment. Orbital is a fun game that requires just a touch of thought and no real investment of time. Shoot lasers against the wall to try to blow up circles. But don't let them bounce back to you. 10) Google Sky Map - If you've ever wondered what stars those are in the sky, Google Sky Map can answer that easily. Just open it, point it to the sky and compare the screen with the celestial bodies you see. It may not be particularly *useful,* but you can impress friends with it at the very least. An interesting feature allows you to "time travel," so you can see what the sky looked like a year ago, 10 years ago, the day of your birth or the day of Christ's birth. You can also go forward.